Every single year, thousands of people are infected with the influenza virus, more commonly known as "the flu", which causes terrible suffering and can sometimes lead to death in those most vulnerable. GP surgeries are full to the brim with flu-related visits and hospitals feel the struggle when coping with a massive increase in overnight stays. Not only does the flu affect our health and hit the NHS budget dramatically, those who are infected will most certainly need to take time off work, which isn't good economically for both employer or employee. This is why NHS Health Scotland, Immunisation Scotland and all healthcare professionals such and doctors, pharmacists and nurses recommend that you get immunised for the flu. This is done by receiving the flu vaccination, or the flu jab as it more widely known, and in this article, we're going to explain how and where you can get it done in the city of Glasgow. The flu is a very contagious respiratory virus that can be spread easily throughout the population, usually through the mucus from the mouth, for example, coughing, sneezing or kissing someone. There are various strains of the flu but the most common types are strains A and B in the northern hemisphere of the world. The flu can affect people of all ages, gender and race. The flu is most prevalent in the winter months between October and March but people can still contract the flu throughout the year. The degree of symptoms when someone is affected by the flu can vary and is often confused with the symptoms of the "common cold". Flu symptoms are usually much more aggressive and longer lasting (sometimes up to 2 weeks) and are more than likely to make you bed-ridden. The flu jab provides the best form of protection against the flu. It works by stimulating the body's immune system to produce white blood cells that will defend you if you become exposed to the virus. Although it is very effective, it isn't 100% effective since you could be infected by a strain that isn't covered by the vaccine. In saying this, it will offer you around 90-95% of protection from the prevalent strains that exist in Glasgow and the whole of Scotland. You will not be protected instantly after the vaccination since it takes some time for your body to produce enough white blood cells to offer immunisation. In general, you'll be protected after around 21 days for vaccination so you can still catch the flu at that time. You need to make sure you're keeping good hygiene to prevent an infection from happening. 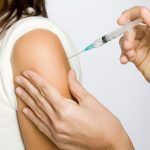 How do I get the flu jab in Glasgow? Your local pharmacy is the easiest, quickest and most convenient way to get a flu jab. Although pharmacies in Glasgow don't offer the free vaccination under the NHS as of yet, they can provide it to a wide scope of people for a very small fee. It is highly recommended that you get the flu jab if you are over 65yrs of age or you suffer from a chronic illness, particularly of the airways (e.g. asthma, COPD, emphysema) and the immune system (e.g. cystic fibrosis, chronic heart disease, liver failure). It is advised that you call up your pharmacy to inquire if they offer the flu jab service, or visit Pharmacy Flu Jabs and find a pharmacy near you that does there. Your GP surgery will offer the flu jab free of charge to those most vulnerable but at specific time slots. To inquire if you're eligible for the free jab, please visit NHS Inform, contact your local surgery and enquire. Our pharmacists in every single one of our branches are fully trained to provide the flu jab quickly, safely and effectively for those of you in Glasgow and the surrounding areas. Our confidential service is supported by healthy living advice on how to stay healthy this winter and the best thing about it is that we offer a walk-in service, meaning we work around your schedule. To protect you and your family this winter, you can count on Reach Pharmacy.